And despite the fact that Howard Hawks seemed to master every genre from the gangster picture with Scarface to the screwball comedy with Bringing Up Baby to the film noir with The Big Sleep-- making in fact very few westerns in comparison to the era’s most famous genre director John Ford (with whom he shared John Wayne countless times) -- it's his westerns that have become especially beloved over the years. While my favorite Howard Hawks western is undoubtedly Red River starring John Wayne in the role he frequently stated made Ford finally realize that he could actually act alongside the irreplaceable Montgomery Clift-- Hawks' biggest hits seem to be the ones that blended together all of the elements from his previous genre pictures like the slapstick of Baby to the professionalism of Only Angels Have Wings to the sultry dames played by Lauren Bacall in movies such as The Big Sleep. 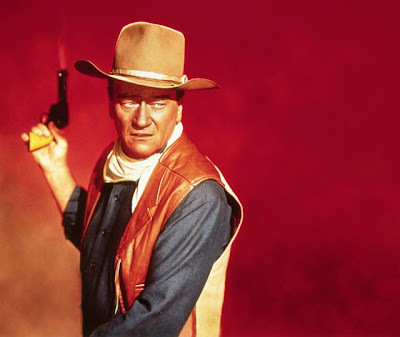 And to this end in 1959, Hawks made his most rousingly entertaining western with Rio Bravo (again starring The Duke and penned by Brackett) which was originally envisioned as a right-wing response picture to their distaste for the Gary Cooper classic High Noon which Hawks and Wayne found downright un-American (for more on this subject, read my essay on the films here). 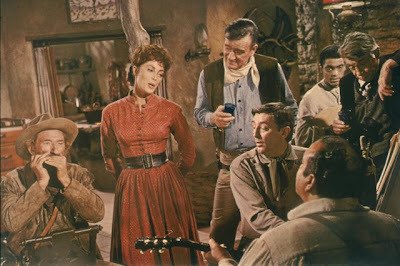 Containing what can arguably be considered Dean Martin's best on-screen performance as an alcoholic law man driven to drink due to trouble with a woman (a frequent plot device), Rio Bravo found Martin teaming with veteran tough Wayne, the kid “Colorado” (Ricky Nelson), and a disabled Stumpy (Walter Brennan) to take down a ruthless villain. 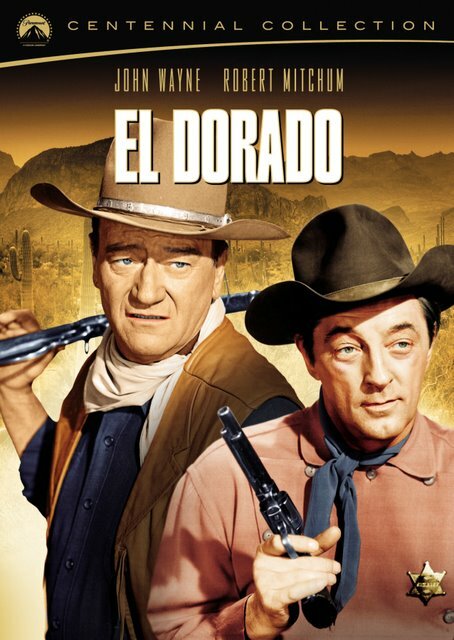 After a couple of flops and although Hawks vehemently denied the claim, he remade the film for a second of what would eventually be three times (resulting in their final western together, Rio Lobo) via 1966’s El Dorado which began filming in ’65 but was ultimately released in ‘67. In doing so, he returned to the same Old Tucson location set where he’d filmed Bravo years earlier complete with those smaller buildings that made the tall actors look even larger than life. Additionally he reworked the earlier premise with the help of Brackett who (along with Wayne) had actually wanted to be more faithful to novelist Harry Brown’s darker, Greek-tragedy inspired western book The Stars in their Courses but they ultimately abandoned most of the literary source material in favor of something Hawks considered far more entertaining. 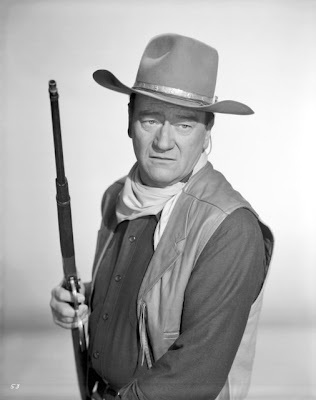 A classically structured western and one that—as the antithesis to the increasingly dark but brilliant works of Ford (like my personal Wayne/Ford favorite The Man Who Shot Liberty Valance) that didn’t give Wayne a whole lot to do—Hawks' film used a far more comedic, fast-paced structure that true to form, Hawks would add to on-shoot sitting in his chair and rewriting lines on yellow legal pads during filming. As cinema scholar, filmmaker, and indeed commentary track contributor Peter Bogdanovich revealed--in one of two commentary tracks included on El Dorado’s most recent Paramount release—Hawks, who didn’t direct actors too much other than telling them to just pick up the pace, never wanted to linger over action and preferred to instead making his violence fast and economical without lingering over it, for example in the way that era’s up-and-comer Sam Peckinpah did in The Wild Bunch. 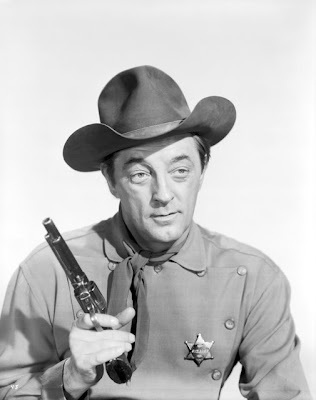 This is evidenced throughout the rather simple tale of Wayne’s hired gun who—upon realizing that El Dorado’s town sheriff is his old friend J.P. Harrah (Mitchum, basically taking on Dean Martin’s Bravo role)—turns down the offer to work for Ed Asner’s greedy land owner who’s violently strong-arming the local MacDonald family. 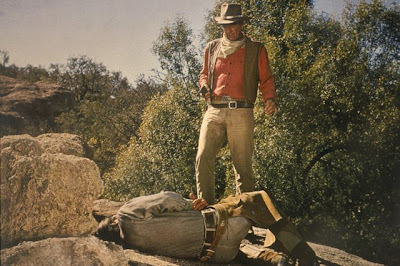 After gunplay erupts and time passes, Wayne’s Cole Thornton and his new knife-throwing vengeance-filled sidekick Mississippi (a dynamite James Caan in a better role than Nelson’s in Bravo)-- who can’t shoot a gun to save his or anyone’s life-- ultimately end up joining Harrah. 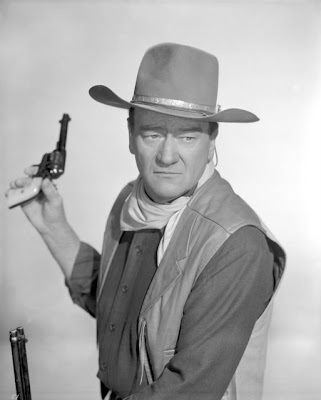 With Mississippi in tow whom he’s fixed with a sawed-off shotgun to try and help even out his new friend’s weakness, Thornton returns out of friendship and loyalty when he discovers that his colleague has not only become a heartbroken “tin star with a…drunk pinned on it” but that Asner’s Bart Jason has recruited one of the best gunman in the area in the form of Christopher George’s Nelse McLeod. While they weren’t exactly attempting to reinvent the wheel and upon its delayed release the very traditional studio picture became a surprise box office hit in the wake of a studio and Hollywood filmmaking atmosphere that had definitely begun to change to the era of ‘70s auteurs like Bogdanovich, Scorsese, Coppola, De Palma and others—it still holds up as an enormously entertaining work to this day. Intriguingly, although he’d be crucified for it now, Hawks’ defiance of logic and geography was bold as brass throughout. 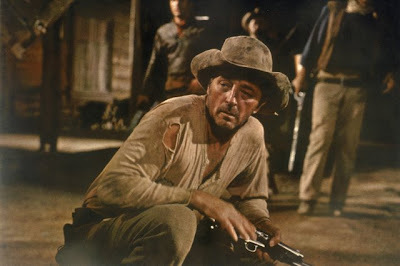 In El Dorado, for the sake of a better shot, Mitchum switched which side he uses a crutch on throughout which resulted in hilarious problems in continuity that prompted a great line by former continuity expert Wayne in the final cut and likewise, he abandoned reason in having the men double back around town in a chase sequence that doesn’t really make a whole lot of geographical sense. However, in this case it's all completely forgiven. This is owed as much to the overall excitement of the film and our reverence of all involved spouting spirited quips and undergoing some pretty great pratfalls (especially via a few humdingers by Mitchum that display his little-known comic side) as it is to the fact that Hawks was definitely right in his assertion that it’s always okay to let characters wander around. And this is especially easy to "fake" when a majority of the picture occurs at night to hide the gaffes and ratchet up the tension. Filled with impressively lit night shots that resulted into a critical disagreement when Roger Ebert playfully suggested that Ms. Pauline Kael needed to have “her glasses scrubbed” when she penned an exaggerated complaint to the contrary, there’s a tremendous standout in the picture that finds the men slowly meandering through the streets, guns out and ready to take down a killer. However, as Bogdanovich noted it is filled with reaction shots that are more about Wayne and Mitchum’s relationship and less about getting the bad guy in the end. In a terrific sequence that—like Dean’s in Bravo—finds Mitchum having to prove his mettle by no longer further embarrassing himself in a bar shootout—Hawks simply lets the men wander for what must have been more than a dozen minutes. In doing so, they stalk all around town, church bells are used to curious effect and despite the large absence of fast-paced jokes, they still manage to work in a great line and gag when Caan’s Mississippi “hits” a bad guy not with the gun but by shooting a sign that hits him instead. The result is pure Hawksian western poetry (that also includes its Edgar Allan Poe namesake in the poem quoted by Caan) with its depiction of a group of male outsiders coming together to try and set things right. Additionally, much to Brackett’s credit in improving upon the role that Angie Dickinson played in Bravo, she offers not one but two superbly written characters for actresses Charlene Holt and Michele Carey, ensuring that although you’ll never mistake the look and feel of a Hawks western for the mid to late 1960s filmmaking going on elsewhere, at least on some levels (despite one horrible Asian caricature scene) the film tried to change with the time. 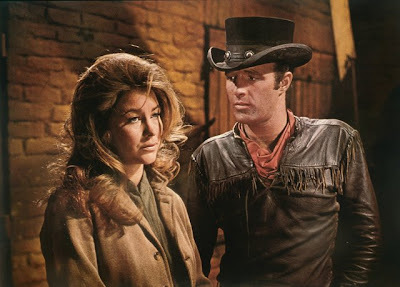 And in fact, the lovely Michele Carey (one in a long line of Hawks’ favored memorably voiced brunettes) actually gets the chance to legitimately become a part of the gang by the end in a great shootout that likewise includes a nice twist on Hawks’ and Duke’s thematic and conversational emphasis of “professional courtesy” in a final showdown. 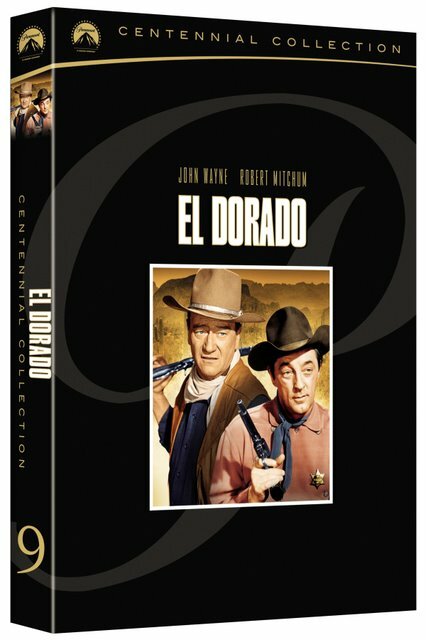 El Dorado was released as part of Paramount’s ongoing 2-Disc Centennial Collection titles in tandem with their other Duke offering—John Ford’s The Man Who Shot Liberty Valance. And while the widescreen print looks gorgeous and sounds dynamic (watching as I did in its original Mono as opposed to an enhanced Dolby Digital), in addition to the commentaries and a beautiful full-color booklet of facts and photos, the second disc features a seven-part documentary on the film along with galleries, the vintage trailer and featurette on the American west artwork included as well as a remembrance of John “Duke” Wayne.